BP has previously blogged on DeepSouthWatch’s statistics on the violence in the Deep South in 2007 (here), 2008 (posts here and here), 2009 (here), and up until September 2010 (here). At different times, the security agencies and governments will say the situation in Thailand’s Deep South is getting better. The question is then, how can you evaluate if the situation is getting better? To only examine whether the number of violent incidents is declining doesn’t fully answer the question. It could be possible to have a reduction in the number of violent incidents, but more deaths (i.e bigger bombs). Therefore, BP will look at deaths, injuries and incidents. All these statistics come courtesy of Ajarn Srisompob of Deep South Watch, but if there are any errors in converting the statistics into charts then those are errors by BP. BP should note that the below figures are not necessarily all insurgent violence. For example, in 2004 you will see large death tolls in April and October. This was not only because the insurgents were killing more people, but the state was through the Kru Se and Tak Bai incidents. In addition, it is difficult to discern between insurgent and non-insurgent violence as the insurgents do not leave calling cards. It is estimated that around 25-30 percent of the violence is non-insurgent, but the culture of impunity and violence can also be a contributing factor to an increase in non-insurgent violence so it is not as though insurgent and non-insurgent violence is unrelated. Whether a corner has been turned or the progress can be maintained is still open to question, but there is no doubt there has been a dramatic drop in the violence. BP: Nevertheless, as you will also see that while things started to improve in 2008, the number of deaths and injuries since 2008 have also not dropped dramatically (i.e rough the same number of deaths and injuries in 2008, 2009, 2010, and 2011). Unfortunately, the improvement in the security situation should have resulted in moves towards a political solution in 2008 and onwards, but there has been little progress on this front. NOTE: Yes, the January 2009-March 2012 timeframe is rather arbitrary, but the width of the space for a blog post is limited so can only include around 40 months. BP has also included full statistics from January 2004 to March 2012 as well although you will need to click on separate links to get the full-size image. 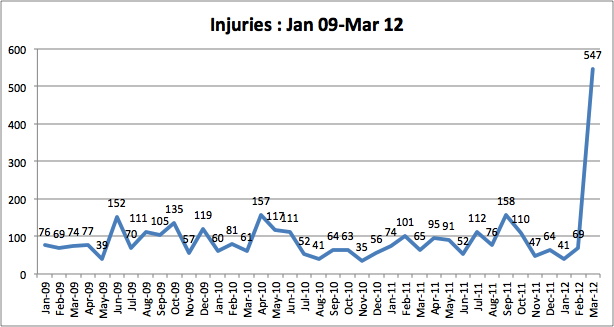 BP: As you will see – also from the below chart – 547 injuries is the most number of injuries in a single month by far. BP hasn’t seen an exact breakdown, but there were around 350 injuries from the March 31 Hat Yai bombings and more than 100 injuries in Yala (MCOT). Hence, these two incidents explains the increase in the number of injuries. Most of the injuries were minor, ie. smoke inhalation, and vast majority went home that day. 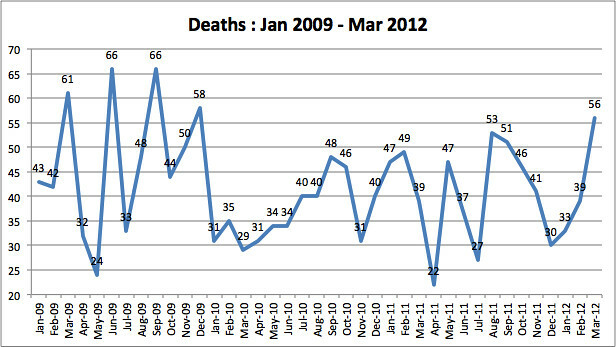 This is not to understate what happened that day, but it is a single day and on its own, it does not yet suggest a sustained increase in violence – you can see there were 221 injuries between November 2011-February 2012 which is less than the number of injuries in the two months prior to this (i.e September-October 2011 where there were 268). The violence goes up and down like a yo-yo at times – look at deaths in Chart 4 in particular – so we need to wait for another 3-6 months to see if there is a consistent increase. Nevertheless, the demonstration of the increased capacities of the Hat Yai and Yala bombings shows the insurgents have the capacity to dramatically increase the number of fatalities from a couple of incidents, but we are still waiting to see whether this will happen (i.e was March 31 a one-off, an escalation, or something in between – BP things the latter). A larger size chart can be found here. BP: Despite the large injury toll, incidents were not up. This just demonstrates how much deadlier attacks are now. To paraphrase something that BP read recently, it is more efficient to plant a large car bomb and cause massive damage than to undertake daily drive-bys (i.e riding up on a motorcycle and shooting another person on a motorcycle which exposes the shooter to the risk of getting caught each time). Over time, we have gradually seen more and bigger car bombs. BP: In Part 2, BP will look at recent news about talks and negotiations with the insurgents.